Break Points Bad | That's a Clown Hypothesis, Bro! As a sentimental Roger Federer fan, the last few years have been a little rough, as it’s hard to sustain much hope watching him run into the Nadal/Djokovic buzzsaw again and again (with help from Murray, Tsonga, Del Potro, et al., of course). Though it’s become clear in the last year or so that the wizardry isn’t there anymore, the “struggles”* he’s dealt with since early 2008 are pretty frequently linked to an inability to win the big points. *Those six years of “struggles,” by the way, arguably surpass the entire career of someone like Andy Roddick. Food for thought. 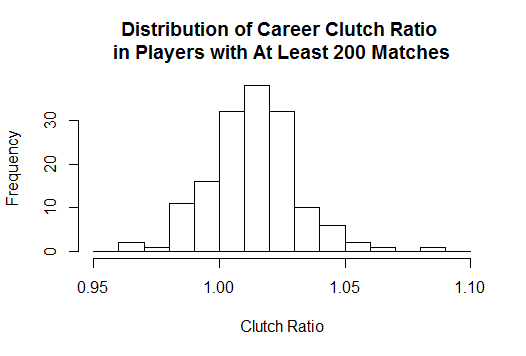 The idea of a “clutch” player is that they should raise their game when it counts. In tennis, one easy way of looking at that is to look at break points. So, who steps their game up when playing break points? Using data that the ATP provides, I was able to pull year-end summary stats for top men’s players from 1991 to the present, which I then aggregated to get career level stats for every man included in the data. Each list only includes some arbitrary number of players, rather than everyone on tour—this causes some complications, which I’ll address later. I then computed the fraction of break points won and divided by the fraction of non-break point points won for both service points and return points, then averaged the two ratios. This figure gives you the approximate factor that a player ups his game for a break point. Let’s call it clutch ratio, or CR for short. This is a weird metric, and one that took me some iteration to come up with. I settled on this as a way to incorporate both service and return “clutchness” into one number. It’s split and then averaged to counter the fact that most people in our sample (the top players) will be playing more break points as a returner than a server. This should be somewhat consistent throughout a career, i.e. a clutch player one year should be clutch again the next. This is pretty self-explanatory, but just to make clear: a player isn’t “clutch” if their improvement isn’t sustained, they’re lucky. The absence of this consistency is one of the reasons the consensus among baseball folk is that there’s no variation in clutch hitting. We’d like to see some connection between success and clutchness, or between having a reputation for being clutch and having a high CR. This is tricky and I want to be careful of circularity, but it would be quite puzzling if the clutchest players we found were journeymen like, I dunno, Igor Andreev, Fabrice Santoro, and Ivo Karlovic. As players get older, they get more clutch. This is preeeeeeeeeeetty much pure speculation, but if clutch is a matter of calming down/experience/whatever, that would be one way for it to manifest. What if we take a more qualitative approach and just look at the most and least clutch players, as well as some well-regarded players? The tables below show some results in that direction. See any pattern to this? I’ll cop to not recognizing many of the names, but if there’s a pattern I can see it’s that a number of the guys at the top of the list are real big hitters (I would put Tsonga, Soderling, Del Potro, and Ivanesevic in that bucket, at least). Otherwise, it’s not clear that we’re seeing the guys you would expect to be the most clutch players (journeyman Dolgov at #3? ), nor do I see anything meaningful in the list of least clutch players. Unfortunately, I didn’t have a really strong prior about who should be at the top of these lists, except perhaps the most successful players—who, as we’ve already established, aren’t the most clutch. The only list of clutch players I could find was a BleacherReport article that used as its “methodology” their performance in majors and deciding sets, and their list doesn’t match with these at all. Since these lists are missing a lot of big names, I’ve put a few of them in the list below. In terms of relative rankings, I guess this makes some sense—Nadal and Djokovic are renowned for being battlers, Safin is a headcase, and Federer is “weak in big points,” they say. Still, these are very small differences, and while over a career 1-2% adds up, I think it’s foolish to conclude anything from this list. Our results thus far give us some odd ideas about who’s clutch, which is a cause for concern, but we haven’t tested the most important aspect of our theory: that this metric should be consistent year over year. 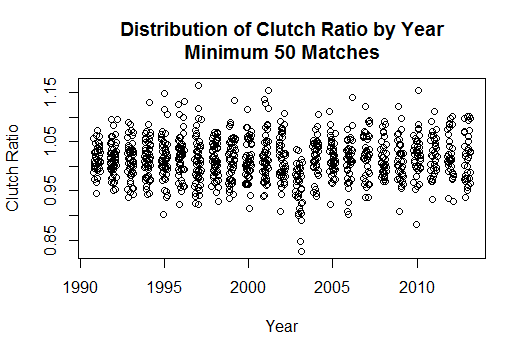 To check this, I took every pair of consecutive years in which a player played at least 50 matches and looked at the clutch ratios in years 1 and 2. We would expect there to be some correlation here if, in fact, this stat captures something intrinsic about a player. As it turns out, we get a correlation of 0.038 here, which is both small and insignificant. Thus, this metric suggests that players are not intrinsically better or worse in break point situations (or at least, it’s not visible in the data as a whole). What conclusions can we draw from this? Here we run into a common issue with concepts like clutch that are difficult to quantify—when you get no result, is the reason that nothing’s there or that the metric is crappy? In this case, while I don’t think the metric is outstanding, I don’t see any major issues with it other than a lack of granularity. Thus, I’m inclined to believe that in the grand scheme of things, players don’t really step their games up on break point. Does this mean that clutch isn’t a thing in tennis? Well, no. There are a lot of other possible clutch metrics, some of which are going to be supremely handicapped by sample size issues (Grand Slam performance, e.g.). All told, I certainly won’t write off the idea that clutch is a thing in tennis, but I would want to see significantly more granular data before I formed an opinion one way or another. This entry was posted in Announcing, Clutch, Research, Splits, Tennis on December 11, 2013 by clownhypothesis. Very interesting article! Did you run the data for break points on their own serve only? I’m wondering if the year-to-year consistency of that metric would improve compared to measuring both service and return break points. Thanks, Glen! That’s an interesting question with an interesting answer. There’s no correlation for break points as returners, but there is a small but significant correlation (0.121) for the serve points. One explanation, I suppose, is that servers can step their game up by focusing and hitting a very good serve more easily than a returner can alter the quality of his return (if that makes any sense). This is some small evidence for clutch play, though the small correlation suggests to me that luck plays a much larger role than any intrinsic skills. If you’re curious, the career top 10 for this more stable, serving-based metric are Jan Siemerink, Mark Woodforde, Kenneth Carlsen, Andrei Chersakov, Jeremy Chardy, John Isner, Fabrice Santoro, Thomas Muster, Alexander Volkov, and Jeff Tarango. I’m not sure what to make of that list.